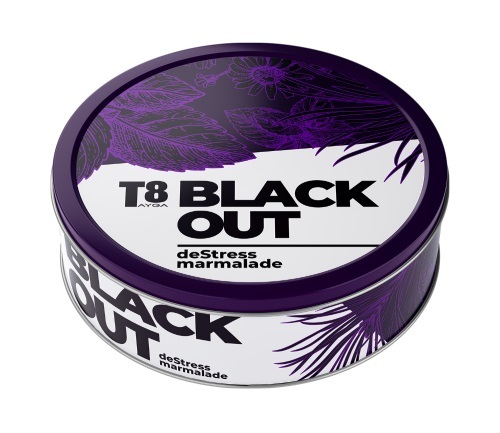 T8 BlackOut is marmalade on the basis of SibXP-Complex with an expressed relaxing effect. It is an opportunity to quickly relieve stress and to better restore after a busy day, in order to be even more energized and active on the next day. If you are sad, just eat a marmalade, and the sadness will go, and the world will fill up with tranquility and serenity. Mint extract reduces pains and spasms, calms the nervous system, improves the brain function, has a sobering effect, tones and strengthens the human body. Melissa extract has a general strengthening effect on the organism, has a healthful effect on the cerebral vessels, has a toning effect, normalizes appetite, eliminates pains, possesses an anti-inflammatory and anti-viral effect. Passiflora extract normalizes blood pressure, cures insomnia and normalizes sleep, reduces neurasthenia, is used in the treatment of alcoholism, improves sexual potency and working capacity. Hypericum extract eliminates depressions, has an analgesic effect, can reduce alcohol dependence, is an excellent antiseptic. Valerian extract is helpful with headaches, cramps, nervous excitations and deep emotional stresses; rapid heartbeat, shortness of breath and asthma. Origanum extract has a calming effect, is helpful with insomnia, stress situations, nervous excitability, neuroses and hysteria, helps with headache, migraine. Chamomile extract is an excellent analgesic, has a calming effect, is beneficial to the nervous system, has anti-allergic properties and is active against viruses. Leonurus extract normalizes arterial pressure, alleviates spasms of cerebral vessels, eliminates nervous disorders, improves overall health and sleep, normalizes heartbeat. SibXP-Complex strengthens your health due to polyprenols, fir cell juice and the needle extract of CGNC. A complex of taiga herbs relaxes your body and expands your mind, and SibXP-Complex strengthens the nervous system and normalizes the functions of the whole body. T8 BlackOut is a sweet that is good for your health. Energy value: 228 / 960 kcal/kJ. Nutrition value: proteins – 4.3 g, fats – 0.14 g, carbohydrates – 51.3 g.
Store at the temperature of 15-20°С and relative air humidity of 80-85%. Keep away from direct sunlight. 5 packets of 70 g.